Click on the stop name to see where and when the mobile library stops near you. 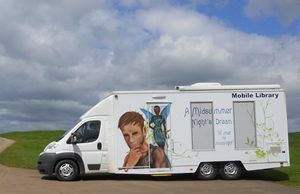 Our mobile libraries make almost 300 stops across Warwickshire and the Metropolitan Borough of Solihull. They’re easy to spot in their Shakespeare themed liveries – Hamlet, A Midsummer Night’s Dream, and Romeo & Juliet. Please note: the service to the Borough of Solihull will cease at the end of March 2019.